Love that Topbox is on their game and allows subscribers to receive their box in the month that it is supposed to be. Early, even! – This shampoo is made from natural and organic ingredients; it sure does smell like it! It is a decent size as well and will be good for travel. – I have actually been looking to try a BB cream. How convenient! I’ve heard so much about BB creams and have been searching for one that actually works. Can’t wait to see how this one turns out! 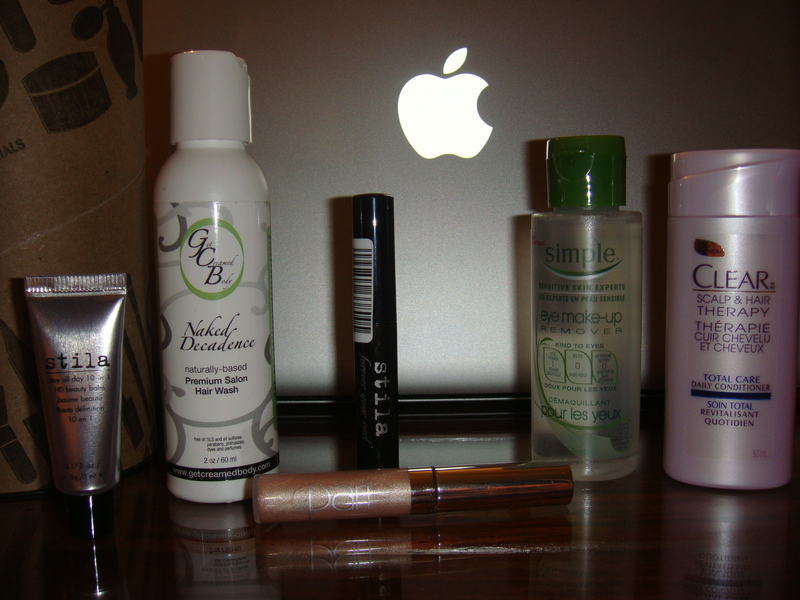 – I have already found my HG mascara so I am reluctant to try anything else. I looked up reviews on this one however and it doesn’t look too good.. Yikes! – This is an interesting product. It is a versatile liquid shimmer lotion that you can use on the face (highlighter), eyes (eyeshadow primer) or body to create a sun kissed bronzed look. I actually thought it was a lip gloss before I read what it really was. – I guess you must include a conditioner if you give a shampoo (hair wash)! This conditioner has a nice floral scent to it. – I have received the make up wipes from this brand in an earlier box and found them to be quite useful. I do wear eye make up most of the time, so I am excited to see how good this remover is. Overall, I am once again happy about all the products. The one product that I don’t think I’ll be using is the Stila mascara just because I am using one that I already love. Other than that, can’t wait for next month’s! What did you receive in your June Topbox? July 2012 Topbox « take her word.